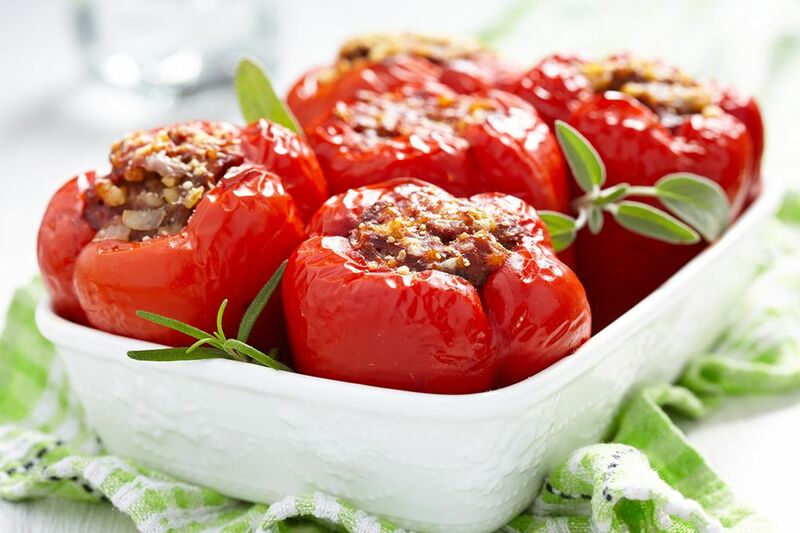 The filling for these savory stuffed peppers is meatloaf; only instead of using bread as the base, this recipe uses cooked rice. A blend of short and long-grain brown rice is an excellent option, but you can use any rice you prefer, either white or brown. Stuffed peppers are a great way to use leftover rice. As for the meat, this recipe uses a combination of ground beef, pork, and veal, but again, you could use all beef. The added flavor the pork brings is a nice touch but tends to have more fat, so this recipe limits it to 6 oz. Any combo that adds up to 1 1/2 lbs of ground meat will work. You can even use ground turkey. Lastly, you can use any color of bell peppers you want, not just green. Red ones, yellow ones and orange ones can give your stuffed peppers a different look, and you can use an assortment of colors. Fill a large stockpot with water and bring it to a boil. While the water is heating, slice off the tops of the peppers and remove the seeds and membranes. If you need to, you can trim the bottoms of the peppers so that they will stand up straight. Once the water comes to a boil, blanch the peppers for about two minutes, then remove them from the water, drain them and set them aside — Preheat the oven to 350°F. Sauté the onions, celery, and garlic in a little bit of oil until the onions are translucent. Remove from heat and set aside so that they have a chance to cool. In a large bowl, combine the ground meat with the egg, parsley and 1/4 cup of the tomato purée. Add the cooked rice and the onion-celery-garlic mixture and combine until all the ingredients are thoroughly mixed. Your bare hands may be best for this. Season the mixture with Kosher salt and freshly ground black pepper. Carefully spoon the filling into the peppers. You don't want to pack the filling in too tightly, or it'll be too dense. You can smooth the tops into a slightly rounded shape. Arrange the peppers in a baking dish. Stir the thyme leaves into the remaining tomato purée and pour the sauce into the dish and over the tops of the stuffed peppers. Transfer the baking dish to the oven and bake for 50 to 60 minutes or until an instant-read thermometer reads 160°F in the centers of the stuffed peppers. Remove the dish from the oven, let the peppers cool for 5 minutes and serve.